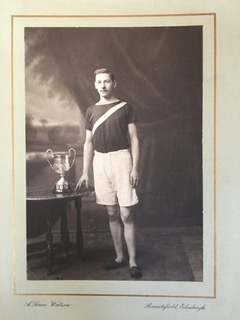 The photograph above is of Thomas Campbell Hughes of Edinburgh Harriers who was one of the best club runners of the early 20th century. He emigrated to America not long after the above photograph was taken and his grand daughter, Laura Bartlett, has been in touch with some information about him that is of genuine interest to all interested in the history of Scottish distance running. Before we look at his records as far as we can follow them, it might be worth looking at the club running scene at the time he was running. The following paragraph is taken from Colin Shields’ centenary history of the Scottish Cross-Country Union, “Whatever the Weather”. “Edinburgh Harriers, a larger club and one of the powers of the sport at that time also had an interesting fixture list. It included 10 inter-club runs, with away trips including Galashiels and Glasgow, and an inter-club run and football match with Watsonians at Myreside on Christmas Day. Club races ranged from a two and a half mile handicap to the 10 mile club championships and teams were also entered in both the Eastern and National Championships. George McKenzie, who was to be Honorary President of the Union and gain 10 international vests for Scotland in the period 1909-14, was always an enthusiastic advocate of cross-country running. In a newspaper interview, he said “It is distressing to see the number of young men in our public parks on a Saturday afternoon watching a football match, blue in the face and shaking with cold. Compare them with the athletes who, with blood coursing through their veins, are enjoying healthy exercise with a harrier pack.” He explained that on Saturday afternoons three packs – slow medium and fast – covered the laid trail through the country with beginners naturally starting with the slow pack and working their way up as they felt more capable. “Any young man who cannot run four miles with a harriers slow pack should see a doctor at once”, said Mr McKenzie. That was the kind of environment that Hughes and others of his generation were used to and the context in which his running should be seen. It should be noted that the times and performances were of a high standard and would not disgrace any ordinary club runner today. Thomas had three brothers who were also runners: two of them were also Scottish international runners. They were RE (Robert Edgar) in 1906 when he finished sixteenth, and JD (John Dunlop) in 1911 and 1912 when he finished 33rd and thirteenth. The three mentioned above all emigrated to the United States but the fourth, Alexander, who also ran for Edinburgh Harriers, fought in the first world war with the British forces and was killed in action. 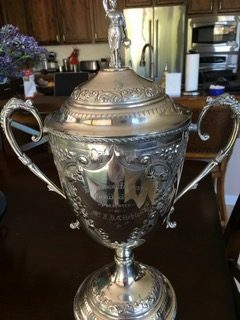 The fine trophy above was the Edinburgh Harriers Challenge Cup which was won by Thomas for the first time in 1901. The National Cross-Country Championships in 1901 were held in Glasgow and TC Hughes finished third leading the Edinburgh team to second place behind Clydesdale Harriers who only defeated them by one single point. Edinburgh was second by only one point behind Clydesdale Harriers. The following year Hughes repeated the act. Winning the club’s 10 mile race for the second time, he followed it with a very good run in the National at Myreside in Edinburgh where he was always up with the front runners, second at half distance, and again finishing third. This time he was again the first Edinburgh runner to finish and again they were second team. The man was running well and, as far as cross-country was concerned, clearly the best that Edinburgh had to offer. But it would get better. If 1901 and 1902 were good, 1903 was even better. There was no Challenge Cup for TC this year but there was a bigger target to aim for. 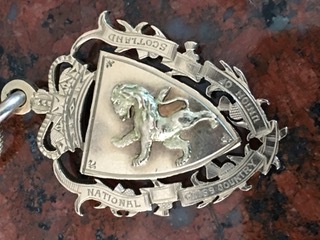 In early 1903 discussions were held by the Irish and Welsh associations regarding an international race were enthusiastically supported by Scotland despite opposition from England who held themselves apart. Apparently they felt that an international championship would detract from their own championships. Being English, they suggested that their own championships, open to all-comers, should incorporate the international. When it was clear that the other countries were going ahead with it anyway, they agreed to send a team of 12 runners to the first ever international cross-country fixture. It was to be held at Hamilton Park Racecourse in the west of Scotland on 28th March. As one of the top Scottish runners of the day, Hughes must have been motivated by the prospect. The season progressed and the Scottish National championship was held on 14th March at Scotstoun Stadium in Glasgow. The race was won by an Irishman, PJ McCafferty running for the West of Scotland Harriers, which caused some problems, but Edinburgh won the team race handsomely from Clydesdale Harriers with Thomas in sixth place. This ensured selection for the Scottish team to face England, Ireland and Wales two weeks later. In this race he finished twenty first of the 40+ competitors and was one of the top six Scots from their team of 12. The medal shown here was the winning team medal from the National of 1903. It should maybe be pointed out that although the history books list the race as having been held at Hamilton Racecourse, it was run in the grounds of the Duke of Hamilton’s Palace. The race started in front of the Racecourse Grandstand and after 300 yards went in to the grounds of the Duke’s estate returning to the racecourse for the finish. In 1904 the championships were held at Whiteinch in Glasgow and Hughes second, but first in the team race. How did this one come about? The race was won by J Ranken of the Watsonians club with Hughes second across the line. However Watsonians did not field a team for the team competition so Hughes was the first runner in the team competition. First and second in the same race. Edinburgh won the team race again. Earlier in the year, he had won the trophy illustrated at the top of the page for the third time and was allowed to retain it. It was a common practice at the time and many quite valuable trophies were given to runners at open meetings and at some championships. eg Clydesdale Harriers won a gold cup at Newcastle after they had won the two miles team race in three consecutive seasons. The trophy above is engraved Edinburgh Harriers Challenge Cup. Presented by Mr TD Crichton”. This run should have guaranteed him selection for the international match but whatever the reason, he did not run on the day. 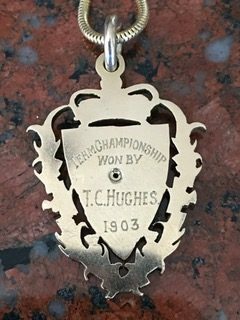 There were two Hughes brothers in the Edinburgh team of 1905 – TD was second counting runner for the club over the 10 mile course when he finished in thirteenth place and RE was 33rd for the team that finished second to the West of Scotland Harriers. It was a good omen for Robert for, although neither was to be in the international in 1905, he was to be in the team in 1906. The National was run in both years at Scotstoun and Robert, despite not being in the first eight on the day was picked for the team. The national was to be held there a fortnight later. He ran well to finish 16th and be a scoring runner for the Scottish team. 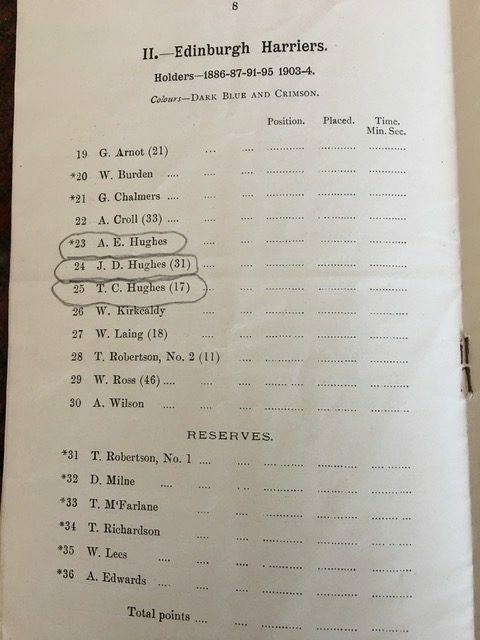 he following year, 1907, the Edinburgh Harriers squad had three of the Hughes brothers in the club squad of twelve. The page below from the 1907 Cross-Country Championship lists the team. The championship was held at Portobello, Edinburgh, on 9th March. 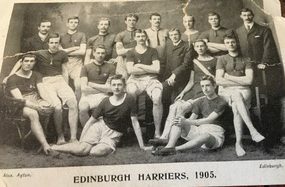 None of the brothers was among the first eight or nine, and the club team was also out of the medals in fourth place – they did however finish two places better than their local rivals of Edinburgh Southern Harriers. At Scotstoun in 1908 there were again no members of the family in the top ten, and this was to be the case until the championships of 1911. The club was now being challenged in its Edinburgh base by the Edinburgh Southern and Edinburgh Northern Harriers clubs but was holding its own and keeping them at bay as far as results were concerned. 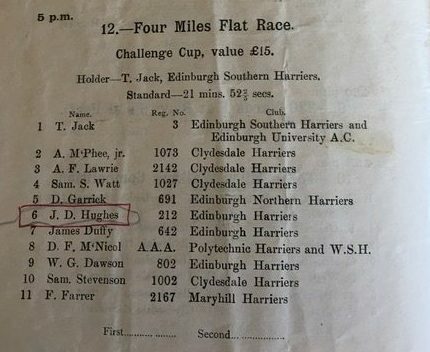 Then in 1911, JD Hughes became the third family member to gain international honours when he finished fourth in the National Championships at Pollockshaws in Glasgow. He was the second finisher for the club and the club won the championship for the first time since 1904. At the selection meeting on the Saturday evening his selection for the international at Newport, Monmouthshire on 25th March was confirmed. The fixture had changed since Thomas had run in the first ever international in 1903 – France had joined the competing teams and the standard of running was higher. The race distance however remained at ten miles. Hughes was 33rd finisher in the race won by Jean Bouin of France. The National Championships were back at the Scotstoun trail that the athletes knew well for the 1912 version of the event and Edinburgh Harriers were third. JD Hughes finished tenth and was selected for the Scottish team of 12 for the international to be held at Saughton Park in Edinburgh. He ran a much better race than before, maybe because he was running in Edinburgh rather than in Wales, maybe because of the earlier experience, and finished 13th. The six scoring Scottish runners were all in the first 22 finishers and the team was second. JD Hughes therefore won an international team silver medal. The club did not enter a team for the 1913 championships at all. The Hughes brothers had all contributed greatly to the cross-country successes of the club and had contributed also to the Scottish cross-country team for a ten year period. They did of course run on the track but were not as successful with no national medals or international appearances to their credit. This is understandable because there was only the one international fixture a year which had only two men per event, and because the standard of running in the endurance events at the time was very high indeed. If we look at the extract from the SAAA Championship programme of 1909 we will see that. 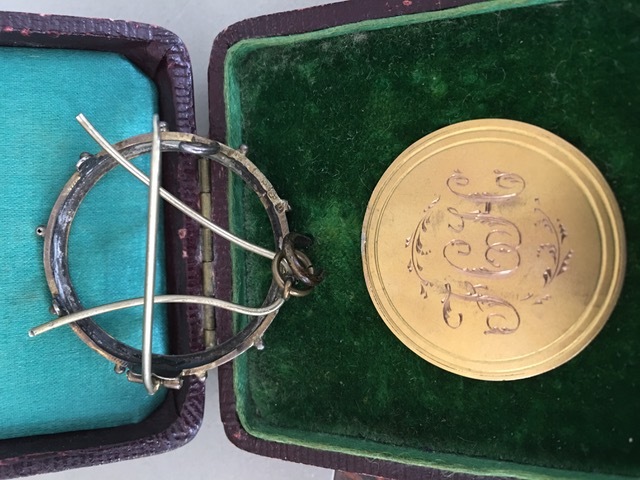 “The North East Cross Country Association Championships were first held in the 1894/85 season and this certainly is one of their silver medals, either individual or team. 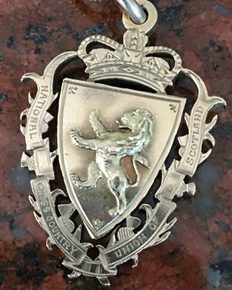 The 3 badges on the medal depict the original flags of Northumberland, Durham and Cleveland (not sure if it was called Cleveland then, certainly the Teesside region). The association covered the area from the Tweed to the Tees. 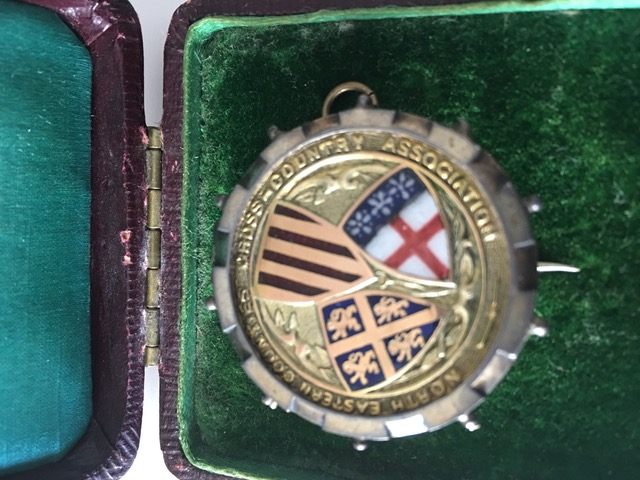 I myself have many of the medals, which have now changed design to the NECAA (North East Counties Athletics Association). The medal now depicts the region with NECAA added. This took place in the 80s, but the term NE Cross Country Association was still in use until 2001 and then incorporated the women’s association, although there had been joint championships since the early 1990s. Mrs Bartlett felt that the family could have been living in England at that earlier point. I contacted Arnold Black, Scottish athletics historian, who said: ” I was looking up for info on JD Hughes and discovered he was born in England in 1892. ” And as we know already, the two were brothers. Their sudden appearance as very good runners in Edinburgh is probably explained by their running in England before a move to the Capital. The search for information goes on. All three emigrated. It was Scottish athletics’ loss.